This week, I’m in the Netherlands. Private stuff and some work appointments. And while I was getting ready to catch my flight Sunday afternoon, in Istanbul there was a huge demonstration going on. Tens of thousands of people gathered to remember the mass killings of Hodyali (committed by Armenian troops against Azeri’s in Nagorno Karabagh twenty years ago, read more about it here) and part of them started spreading filthy racist, nationalist and hateful poison (read more about the demonstration here). I couldn’t help thinking about Holland. Coming to Turkey, a bit over five years ago, has put me in a constant turmoil of re-investigating my opinions. I have been flabbergasted and deeply shocked by the opinions that I have come across, rooted in nationalism. In Turkey, in general (I’ve met great exceptions!) the question is not whether somebody is nationalist or not: you can take that as a given, the question is to what extent somebody is nationalist. This stems from the fact that nationalism is institutionalized. For decades now, children are being taught that being Turkish is the greatest thing of all, that everybody in Turkey is a Turk, that foreigners are always out to weaken Turkey and that there are ‘internal enemies’ as well, like Armenians. I grew up in a small city in the Netherlands, where nationalism was non-existent. The Dutch flag was hardly ever seen – only on Liberation Day and on Queen’s Day some people would display it – and there was no sense whatsoever of a feeling of Dutch supremacy. Children are not drilled about their (real or invented) national identity and we don’t learn the national anthem (or don’t bother to remember it if we do). Add to that the experience of the Second World War, during which my parents where born, and nationalism is labelled dangerous and out of the question. Turkish nationalism has, like I said, shocked and flabbergasted me, butit also made me reconsider my own convictions. Could you also see nationalism as not a bad thing by definition? Was there a point in the theories I heard from nationalists of all persuasions? Discussing these things gave me sleepless nights, and taught me a whole lot about Turkey. And now, after more than five years, I feel I have come back to where I came from. However you look at it, nationalism is dangerous and potentially very destructive. Turkey needs to get away from this institutionalized nationalism to become a country where everybody feels fully accepted as a citizen. The nationalist brainwash has to be replaced by a state of mind that sees richness in diversity. I feel Turkey is very slowly moving towards that, but Sunday’s demonstration also once again made it very clear how deeply ingrained nationalism can be. How hard it is to change a mind-set that has been forced upon people for decades. That’s why it hurts me so much to see what is going on in my own country. While in Turkey slowly but surely it starts sinking in that the one-size-fits-all mentality can never work and that people’s identities need to be able to flourish, the Netherlands is developing in exactly the opposite direction. Politicians, not only the openly racist ones but also those of bigger, more traditional political parties, try to score easy points by being harsh on topics about ‘Dutch identity’. They want to force one ‘Dutch identity’, whatever that is, on everybody, erode differences, force people to be somebody they are not. They put foreigners in a bad light (or don’t fiercely protest when others do) and even suggest they are a ‘threat’ to Dutch values. I find it sickening. Nationalism is potential death, destruction, hatred and violence: Turkey is a clear example of it. And what Turkey also makes clear, is that the essential road towards a multicultural society, where everybody is seen and valued for who he or she is, is very difficult. Dutch politicians seem to be unaware of that, or they just don’t care. I wish they would open their eyes and come back from their dangerous path. They really shouldn’t want to go where Turkey is coming from. 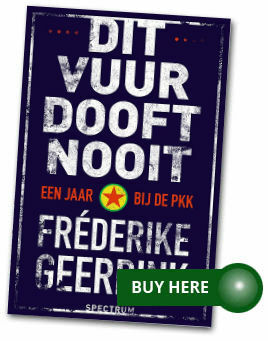 Frederike, I am leaving very close to your city and it is my 4th year in the Netherlands and I really think quite opposite about nationalism in the Netherlands. I was shocked when I started to realize how nationalist people can be here in the Netherlands. Also I have heard that people are blaming Turkey as being a nationalist country etc. Yes people in Turkey on average is nationalist but they accept that fact. On the other hand in the Netherlands people are nationalist but they will probably never accept it because Netherlands used to profile and still trying to profile herself as a progressive, open etc etc country. Recently people (foreigners) started realize that it is not really the truth. – Wilders’ PVV and the recent developments in the Netherlands did not pop out in one day. It seems roots were there but hidden. Nazis got support from %20 of the people of the Netherlands in second world war. – I have never seen that many flags in my entire life until my first Queen’s Day experience. I was also asked why I did not wear orange (basically I never wore orange in my life, I prefer other colors when I dress). – Sinterklaas, zwarte pit = institutionalized racism and love for colonial times. Strange thing is : there were discussions this year but it looks like majority is happy with it and find stupid to question all that stuff. So all in all your writing is a great example of average Dutch perspective (or average western European) about rest of the world and ironic. In Turkey people are brainwashed by institutional nationalism (also they are all fundamental Muslims etc – ignorance has no limits in the end) and in the Netherlands (and in Europe) people are super open minded. Ridiculous ! You have to look back at history first. Before Turkish Republic, people that you find very nationalist used to live together with Armenians, Arabs, Greeks, Bulgarians (just name the others) for about 600 years. My grandparents are from Bulgaria and Romania. So I have real stories from real people. How they lived with Bulgars and how each community respected each other etc. So what happened ? Just go back to 18th century and at the beginning of 19th century. In 1st world war last people of Ottoman Empire (call them Turks or whatever and probably it will not mean anything) fought against Italians, French, British, Greeks and Russians. Also had to dealt with Armenian (mainly provoked by Russians) and Arabic (mainly provoked by British) armed bands. I mean there is a very interesting story and background. One can write pages and pages for a summary. The problem is you just ignore everything and blame and blame. I just gave you some examples about the Netherlands however I am not as strong as you are in terms of my thoughts about Netherlands, nationalism and racism. I see, observe and read. The thing is I would like to understand it more so probably if I could have more time I would read more about the background etc. Nevertheless, after more than 3 years I have enough experience about general perspective here and I am just shocked that how people find the Netherlands superior when comparing against Turkey (or give any other country other than US and north-west European countries) for democracy, nationalism or religious conservatism etc… (just name it). Okay I accept Turkey is not very good and more or less everybody in Turkey accept the reality. However what is that illusion about the Netherlands ? Is it that great really ? Just recently a friend of mine (who looks like a Turkish) was bothered in the bar. He was in a group of expats talking in English as usual and one guy came to him (only to him by interrupting the ongoing conversation in the group) and asked where he is from. He said he is from Turkey and then the guy asked him why he does not speak Dutch… I used to hear the same question almost in every dialog and I notice same question is not being asked to an American or British. This one is already a big topic itself but just told it to give you an example. There are lots of them. If I were writing a blog in the same tone of yours probably it would put you on shame about the Netherlands. However I am not a journalist and spending my majority of time (apart from writing long comments to your blogs :)) for my own profession. Thanks Frederike for another thought provoking blog. I would love to be a fly on the wall to a group of assorted Turks discussing the very same issues, including those who have lived abroad. They would have the most fascinating perspective I suspect. For example how does nationalism differ from patriotism (love of your own culture, flag waving, supporting the monarchy)? I can’t comment on the Netherlands as I have never even visited but I do know that the hatred, sometimes violent, prevalent in so many (but not all of course) in Turkey made me decide to bring my daughter up in the UK. Here she has friends from at least a dozen different ethnic backgrounds and at school regularly marks celebrations from around the world, most recently Chinese New Year, after the Hindu festival of Diwali. Diversity is a given in the ‘system’. As you say Turkey is heading in the right direction which can only be a good thing. Let’s hope that Europe doesn’t regress as many seem to be reporting. Yes actually it is ‘better’ here Candide, not necessarily the ‘best’, please don’t twist my words. I was talking about the general tolerance to diversity in the UK as you well know, if you want to bring in the London riots that’s quite a different matter and had nothing to do with race. In the common parlance of the English language there is a different meaning between being patriotic and being nationalistic. As there also is a difference between being proud of one’s traditions and national characteristics for example while enjoying the riches that other cultures can offer versus the hatred that ultra-nationalism stokes. There are countless such proud-of-their-country yet tolerant people from around the world. A bit like advanced democracy where one can read or listen to the views and opinions of others and think ‘well that was an interesting point, I don’t necessarily agree with it, in fact I really don’t agree with it, but it was worth saying and it made me analyse the situation from a different angle’. Above I gave some real examples from life in the Netherlands. Take your time and label them as patriotic, nationalist or whatever. I am not interested in linguistic differences here. I see it, I live it and I feel it. To be honest I can do the same to you now, I can come and say actually the thing in Turkey is not nationalism but “love for the country”. It sounds really nice, right ?. Then I can tell you all those assorted British people really don’t get the difference in between. Finally I could not understand your problem with Turkey really. You just say “I do know that the hatred, sometimes violent, prevalent in SO MANY (but not all of course) in Turkey made me decide to bring my daughter up in the UK”… And then when I give a reference to riots in London (violence and hatred is involved) you say it is nothing with the race. So are you saying in Turkey there is racism or nationalism or both ? Correct me if I am wrong but as far as I know and history tells : racism and nationalism is a quite an issue in Europe for centuries. I really did not know if there was a breakthrough in England. Finally there is nothing similar to http://englishdefenceleague.org/ in Turkey. I don’t see any problems in Turkey from that perspective. If you see just give me some examples. Formerly it was a multi-ethnic empire and today enjoying the heritage. So might it be your lack of knowledge or very strong feelings that leads you to that conclusion ? Are u spastic?This is something that you create from your head to throw dirt to Turkey. İf u say Armenians had been killed by Turkey, u are line up with human rights..?! But if u say azeris had been killed by armenian people so u are being fascist ha? u always blame to turkey ignorantly..u are an idiot u have been living in turkey for years and u still cant speak turkish that s why u you speak so ignorantly and stupidly that s so boring..
Candide, your ridiculous statements and disdain of other cultures and their habits (not like your cult) is astonishing. But that you accuse the Dutch for being en masse collaborators with Nazi Germany while Turkey was the country which was doing the trade with the Nazi’s and admired them, makes me sick. Turkey was also the country which build the only concentration camp outside Nazi-germany to punish the Jews and Christians (Hitler considered Christians as weak). I advise you never to visit any other country than the Netherlands because you will find each and every country you visit bad according your high Turco standards….joke! Hans, %20 is a fact and I don’t accuse anything (just try documentary of BBC “World at War” or any other trusted source). %20 does not equal to %100. So I am not sure if the idea is well understood. I don’t defend Turkey I just criticize the perspective in this blog which is totally blind when it comes to Netherlands but quite assertive on Turkey (I would say close to being ignorant). Could you please give me a reference about concentration camp in Turkey. It is the first time I hear that. I would be surprised since Turkey is one of the first countries who supported the foundation of Israel and have very deep historical ties with Jewish community. You could understand what I’m talking about here if my latest post still was not awaiting moderation. Considering your tone in your comment there should be no reason for my comment to be not appearing here. Be fair please, what is ridiculous in my statements or how did you infer that I disdain other cultures. Quite nice article. I, too, am quite concerned where Europea is heading. I hope they will reverse this intolerance. Because it would tear apart european civilization. As to the Candide’s frivolous comments… you don’t understand the central theme in Frederike’s article, do you? She is actually telling the Dutch to stop getting more nationalist and intolerant. You’re try to whitewash the wrongdoings of Turkey by Dutch faults. @avid follower : I am not sure if Frederike’s intention is what you are telling. I will put it in simplified form : she tells the Netherlands should not go in direction where turkey’s coming from and I say the Netherlands was already there and Turkey has never been. I am not sure that can be understood without sufficient information about history of nationalism, how it affected Europe and then Turkey. Do you get it better now ? What a shame that this article has lead to a lot of mud-slinging instead of rational debate. @Furkan, your comments (insults) are completely unacceptable, why not show us how wrong Frederike is (as Candide is trying to do) by posting an intelligent counter-argument? @Candide, I take your point about the EDL, they are a marginalised group of brain-dead individuals who are against the multiculturalism of the UK which according to them has resulted in a loss of ‘Britishness’ and the ‘British way of life’. Unless you live in the country it’s difficult to ‘feel’ such things but believe me they are regarded with disdain with the majority of the population. They regularly have spats with another loony, and now-banned organisation, ‘Islam 4 UK’ who mainstream British Muslims are equally embarrassed about. I wouldn’t have thought that Turkey needed such an organisation as EDL as in the post-Ottoman period the ‘Turkish’ way of things has been in the ascendant anyway. The point I’m trying to make is that the overall picture is one of accepted multiculturalism in the UK, of course there are exceptions, but it’s the overall picture. thank you Candide. I well know what you tell. It’s simply not right. turkey is zealously nationalistic country. first give kurds more rights, then lecture about other countries. europe is a pretty fine and multicultural place unlike turkey who happen to destruct much of his multicultural identity in the past 100 years. You have a point Rebecca. Apart from the EDL stuff Britain is a very multicultural and tolerant society. You have 4 different nations (Scots, English, Welsh, Irish) living under the same roof without much bloodshed and discontent. Millions of immigrants live a pretty decent life there too. It’s an envy really. @avid follower : Since I did not take the right of Kurds or other people, don’t have opportunity give it back. However I have right to criticize this article and things you tell. You may think Turkey is nationalist and wherever you belong is far better. Still that does not create any constraints on me to criticize your position and point of view (as well as this article). Here I am not the representative of Turkey. If you can get this basic idea then you may understand what I am talking about. Besides I do not agree with you. I don’t know where you are from but I observed quite a nationalist Europe (neither history tells something else nor the actual developments). You might be blind just because there are no obvious problems like Kurds etc (which has probably economical roots more than any other elements). Nationalism and chauvinism has quite strong roots in Europe and it has been masked by welfare. I am tired of this discussion since I give links and I ask questions, formulate ideas but all I hear back is accusations about Turkey (such as “turkey is zealously nationalistic country”) without any ground. I wonder how you ended up with that idea. Have you ever been in Turkey, do you know the culture and history ? Did you hear me talking like this ? I think your response and biased approach without any self-criticism is a kind of proof what I already explained. Also your comment about UK is just funny. I guess you’ve completely forgotten IRA. Also there are serious discussions for Scotland to be independent. – But don’t forget to be fair and give some room for self-criticism. I find it broken from the first step and talking about it. Not in search of comparing Turkey to other countries or defending Turkey. Sorry for giving lecture here and especially sorry if your pride is hurt that the lecturer is coming from a zealously nationalistic country (a country probably you grew hatred against somehow)… But it seemed to be necessary. Gosh, you’re desperate, aren’t you? Europe isn’t far from perfect, yes it’s true. There’s racism, there’s chauvanism in Europe as well. However this doesn’t absolve the fact that Turkey has always been a nationalist country for 100 years and this kind of crap nationalism is ruining Turkish chances of a fairly stable and prosperous country in harmony with her citizens. Look, there has been a bloody armed conflict going on in your eastern part and freedom of speech is severely restricted. It hurts YOU as a citizen and your fellow countrymen. You can’t simply bury your head in the sand and blame Europe for your ills. You have to fix them. Your tone of lecturing here isn’t helping you. It’s you and Turkey and her citizens suffer these injustices and fervent nationalism. Nobody else. As to Scotland, yeah it can be independent. Nobody gives a toss about it. As long as there’s no bloodshed, nothing will happen there. Scots have a right to self determination. It’s a matter of political choice, not a matter of political oppression. IRA has been disbanded for long. There’re peace in Northern Ireland. I mean “Europe is far from perfect”. Sorry for the typo. Yes I am too desperate 🙂 Help me ! be my guide to living in peace and harmony. Europe is far from perfect. Turkey is far from perfect too. All of you can keep living in your wonderlands. You are right at some point. Things in Turkey are hurting me not because I am a citizen or my connection to the countrymen. It is hurting just because it is wrong. Same thing applies when it comes to Europe or anywhere else. Strange that while it looks like you are putting nationalism down, actually you are promoting it. Nationalism is a creation of Europe, it was born there, grew there, exported from there and still lives there. So theme of this article, and the conclusion part is just zenith of ignorance. I don’t know if I can express my ideas further than this so I put a big PERIOD. Point taken Candide. Nationalism is a product of European civilization. Turks, Greeks, Arabs, Kurds, Armenians, Albanians, briefly all former Ottoman subjects, have imported this concept into their own communities and countries zealously. In fact, despite its all ills and shortcomings, Ottoman Empire was pretty tolerant when you consider all of the carnage and suffering during the middle ages Europe endured. Right now you as Turks and Turkey have been zealously nationalist. You should fix this otherwise you would be wasting your own potential. I’m saying this, because I really like Turkey. I would want to see it as a good decent, well-doing country. You don’t need to get defensive when somebody criticizes Turkey. Yes it’s true that Europe is getting more xenophobic day by day. It’s not good either. The problem with Turkey is that the people are generally good-mannered and hospital, however the state constantly spoon feeds paranoia, zealous nationalism to her citizens. It’s just harmful.